Dallas Observer gives us a shout out! Our sincere thanks to the Dallas Observer's Hanna Raskin, for her writeup on our participation in the official Super Bowl media party. Assuming people can get through the snow and sleet to the House of Blues, it should be a great time. I am really looking forward to sampling from the 10 fantastic BBQ joints that are catering it. Out of the 10 joints, whose table would you most look forward to patronizing? Texas BBQ storms the Super Bowl!!! It has taken months of coordinating, but it all came together nicely. Man Up is honored to have played a small part in it, and I can't wait to hang out with all of the joints and EAT!!! I'll be updating all night via Twitter. Our good friend (and, in my opinion, the state's top BBQ critic) Daniel "BBQ Snob" Vaughn will be there, as well, so follow him on Twitter, too. UPDATE: Due to travel issues, Cooper's & Meyer's will not be attending. This afternoon, Brad and I head to Dallas for tomorrow night's official Super Bowl media party. MUTB had the honor of selecting the 10 Texas BBQ joints that will be feeding the 3,000 media members in attendance. Should be a great time. Will post party updates via Twitter and will, of course, take lots of pics. Brad and I had lunch a couple of weekends ago at the Soulman's in his hometown of Mesquite. We weren't too hungry, so we just split a 3-meat plate: brisket, pork ribs, dark chicken, beans, and green beans. I liked that the pork ribs were a bit crispy on the outside (and tore easily from the bone), and the dark chicken wasn't dry (always a major plus for chicken). The brisket was a disappointment. It was extra lean - dry and chewy. Truth be told, the fault was mine, for I didn't ask for outside and/or fatty cuts, and I didn't pay attention to the cutting. It's not fair for me to give the thumbs down to their brisket, generally, when I wasn't specific about what I wanted. The green beans were great - piping hot and tasty. Which BBQ chain/franchise would you pick? Texas is full of multiple-location BBQ joints, particularly in the bigger cities. But some are more numerous than others. If you came to an intersection and had to pick just one, would you eat at The County Line, Dickey's, Rudy's, or Spring Creek? Bright and early this morning, a big group of us (from what I hear) will be heading from Austin to Lexington for a visit to Snow's BBQ, followed by a quick trip down to Giddings for a second meal at City Meat Market. Feel free to join us. Or just get updates via Twitter. I'm sure loads of pics are to come. Note: This award is for best pork overall. Pork ribs, pork loin, pork chop, pulled pork, etc. Drew Robinson, chef/pitmaster of my beloved Alabama's very own Jim 'N Nick's Bar-B-Q, on why BBQ is important. Hat tip to my brother. Goode Co. Texas Bar-B-Q Super Bowl Giveaway!!! After much anticipation, I announce the start of our Super Bowl giveaway from Goode Co. Texas Bar-B-Q (Houston, TX)!!! One lucky winner will receive a free Brisket and BBQ Sauce Sampler ($85 value), comprised of a whole mesquite-smoked BBQ brisket, a loaf of jalapeno-cheese bread, and a selection of three Goode Co. BBQ sauces (Original, Heavy Garlic, and Jalapeno Garlic). They're shipping, folks, so you can enter no matter where you live! The giveaway-entry period will last through the end of Monday, January 31, & it's a piece of cake to enter, so there's no excuse not to enter - unless, of course, you have an aversion to FREE TEXAS BBQ!!! As for entering, we've decided to make this giveaway as easy as possible. Simply do any of the following to get your name in the hat: (1) Email me your name and mailing address. (2) Tweet about the giveaway. 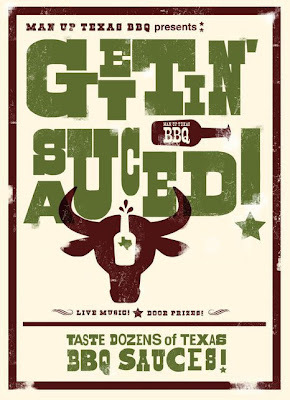 Just make sure you include @ManUpTexasBBQ, so that I will see it. Or simply retweet this. (3) Click "Like" or leave a comment underneath the Facebook post announcing the giveaway. Even a comment as simple as "Yes!" will suffice. If you want to leave a glowing comment about Texas BBQ, brisket, or Goode Co. Texas Bar-B-Q, that'll work, too! Entries accepted through Monday, January 31. We'll draw the winning name and announce the winner on Tuesday, February 1. Good luck! The Brisket and BBQ Sauce Sampler is part of Goode Company's brand-new line of mesquite-smoked Texas barbeque available for customers all over the United States to purchase online. These items ship straight to the customer's door fresh, never frozen. Som regardless of whether we pull your name from the hat, you can purchase any of these mail-order delights anytime you please. As an incentive, every order of smoked meats during the giveaway period (January 24-February 1) will receive a free Goode Company "Thank Your Lucky Stars" Koozie! While driving up 620 today in Austin, I saw that Smoke Shack has closed. As always, I hate to see BBQ joints go out of business. My best wishes to the owner, James. MUTB card at The County Line! 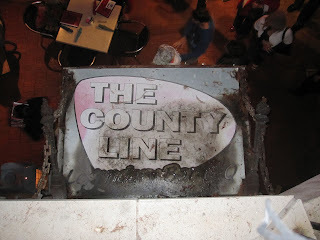 I always stop into The County Line every time I'm on the River Walk in San Antonio. My most recent visit was earlier this month before the USAAAB Welcome BBQ at the Alamodome. Much to my surprise and delight, I sat down at the bar and the first thing I saw straight ahead was one our our cards on the cash register. I thought it was definitely picture worthy. Brad's a signage guy, so he snapped a couple of pics of signs outside the restaurant. Mark your calendars for SATURDAY, AUGUST 27!!! That's the day we will throw the 2nd annual Gettin' Sauced! BBQ sauce contest/festival in Austin. It's late August and will be nice and hot, so we will be sure to have some cold drinks for you! As for venue, we've found one and will announce it soon. Also, sometime in the next 2 or 3 weeks we'll send out the application for contest entrants and vendors. The major change to this year's format is that the contest is open to sauces from outside of Texas (GASP!). So, if you've got a BBQ restaurant or a commercial line of BBQ sauce(s), bring it. Doesn't matter where you are. Great news: The 21st Street location of The Sugar Shack BBQ is back up and running, after it was destroyed by fire on December 15. It's on the UT campus, a block East of Guadalupe. The other location is at 24th & San Antonio. Ate at 79 Texas BBQ joints - probably more, because surely not everyone in our group let me know each time they went somewhere. 79, at least. Continued our features Texas BBQ Wannabes, Battle BBQ, Question of the Day, and Reader Reviews. Threw the inaugural Gettin' Sauced! Sold The Q Card at the Texas Monthly BBQ Festival, Brew B Que, the Hill Country BBQ & Chili Cook-Off, and the 33rd Annual Taylor International Barbeque Cookoff. Got media passes for the Memphis in May World Championship BBQ Cooking Contest and the Music City BBQ Festival. Goode Co. Super Bowl Giveaway Coming Monday!!! I've been teasing it on Twitter and now give it some face time on the blog. This Monday, I'll be announcing a big giveaway, courtesy of my friends at Goode Co. Texas Bar-B-Q (Houston, TX). I won't accept entries until Monday, January 24 (and I'll accept entries thru 11:59 PM Central the following Monday, January 31), but here's a sneak peek at what's gonna go down. Spread the word, and don't miss your chance to win this fantastic prize that you can enjoy during the Super Bowl. As with all of my giveaways, the only bad thing about this one is that I can't win it! Others receiving votes: Cooper's, Schoepf's, Franklin, Vincek's, Mann's, & Louie Mueller. Up next: Best of 2010! Tomorrow morning, we'll announce the first of our Best of 2010 awards. And for all you rebels out there who eat your dessert before your entree, the first category is in your honor: Best Desserts. Before we announce our favorite, what's yours? Of all the BBQ joints/caterers in Texas, who has the best desserts? QOTD: What's the best BBQ in Dallas? Best of 2010 on the way! Cartwright's Bar-B-Q (Bastrop) is closed. QOTD: Best sausage in Texas? Vote in our BBQ polls! 20.11% off MUTB gear through Thursday! What were your favorites in 2010?